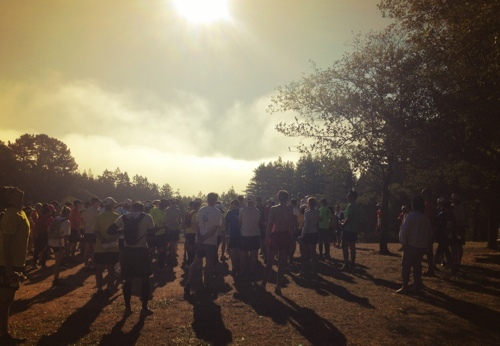 This past Saturday, I ran Coastal Trail Runs’ Crystal Springs Trail Run. 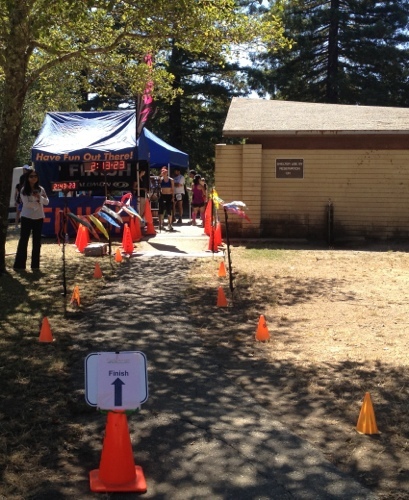 The event, held at Huddart Park in Woodside, was actually five trail runs in one: 5 Mile, 11 Mile, 22 Mile, Marathon, and 50K. The weather was great – it was actually nicer at the park than down in the valley! On the way to the park it was a little foggy, but it was gone once I arrived. The temp was around 60 when the race started and it warmed up to about the mid-70s when I finished. The run drew 251 participants, with most running the 11-mile distance (5m: 58, 11m: 85, 22m: 43, Marathon: 29, and 50K: 36.) From my conversations and hearing the chatter among my fellow runners, there was a mix of trail runner levels – though I highly doubt any were new to running overall. I talked with a few follow first time trail runners before, during, and after the run – which was nice, as I was a little nervous about this, my first trail run. The longer distances were grouped together for their 0830 start, with the 11 and 5 mile runs starting separately at 0900 and 0915 respectively. The 11-mile course made its way along several of the redwood and fern-packed trails of Huddart Park. Most of the course was under the trees, so the shade was nice as the temperature climbed. It was nice that Coastal Trail Runs puts extensive course info on their sites, so I knew what type of terrain, climbs, etc. to expect. 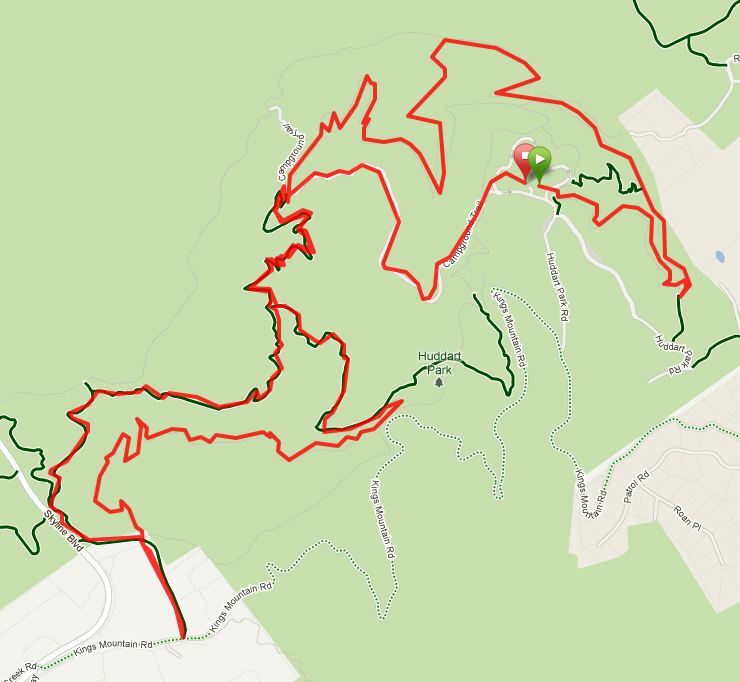 The 11 mile course data was: Elevation Gain – 1,890′; Single Track – 73%; Fire road – 22%; and Asphalt – 5%. On-course marking was excellent as well – I guess a person could get lost, but if you run with a basic situational awareness, the markings are easy to follow (at least they were on the 11-mile course.). 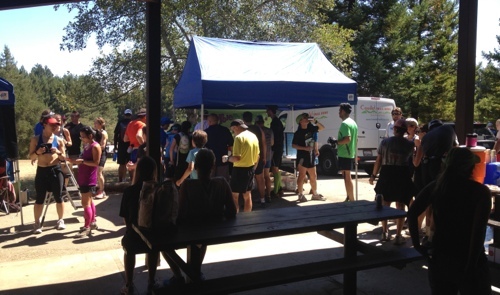 The aid station was awesome – a mix of salty, sweet, and carbs with either water or electrolyte drink to chase it down. At the finish line, there was a great variety of food and drink for runners – and really a great atmosphere to recover from the run. People were just hanging out, talking, waiting for other finishers, and enjoying the shady area. People in the picture: Excitement mounting! Official time: 1:49:02 at an 10:17/mile pace. As I mentioned above, this was my first trail run. I originally planned to run the Bay Area Half Marathon on this day, but didn’t see too much info on their website and got nervous about the race back in late June (they actually cancelled the race due to poor registration.) After watching Unbreakable: The Western States 100 for about the 4th time, I thought about working in some trail runs in my training. This run seemed doable (I shot an email to Coastal to confirm that) and the rest is now history. I’ve been running up in Alum Rock Park at least once a week for the last 1.5 months just to get used to trail running. Overall, it was a great day! I went to the run with no firm, finish time goal – though I did see what my pacing would need to be to finish at a few specific times (the competitor in me!). Still, I purposely DID NOT print a pace band or tag to carry with me as I usually do. My main goal for this first trail run was to have fun, test my training, and see how things worked with running on a trail during a race. I got a little nervous about the run once I got home. My Garmin only showed that I ran 9.6 miles! I compared the Garmin route to the run’s course and they matched, but I wondered if I somehow cut the course! I figured it was my watch (it also said that I ran a 3 min pace for the first 1.2 miles! ), but I still shot an email to the race organizer checking to make sure. I knew I was always on course (due to the great marking) and had someone in sight pretty much the entire time, but still! Turns out, it was my GPS…whew! As for pre-race fuel and prep, I carb loaded the day before, by eating a high percentage of carbs (82%) by exceeding my daily caloric intake by ~550 calories. On race morning, I ate a bagel at 0600 and a couple of GU gels at :45 & :15 before the start. During the race, I took a GU every 2.5-3 miles and drank about 20 oz of GU Brew and 20 oz of water. I grabbed a banana piece at the mid-course aid station as well. This fuel plan (which I’ve followed for the last 3 half marathons [x2] and this run) seems to be working. 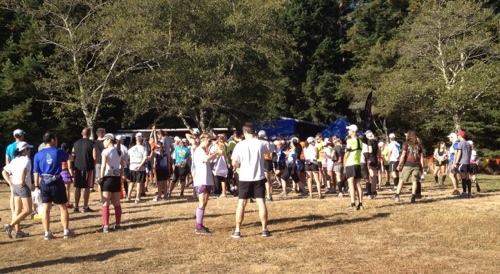 Crystal Springs was a fun experience – and the first of many trail runs for me. In my preparation for the Honolulu Marathon, I have a solid training plan and am registered for a series of half marathons already, so I may not be able to work in any trail runs the rest of this year. We’ll see though! gotta check my options! Even so, trail running is great – and I’m hooked. Post-race meal: McChicken and fries! Comments: I did 4.5 @ an 8:25 pace.